Beauty Foods beauty blend is the most delicious beauty supplement ever. Each decadent flavor is made with premium, all-natural ingredients and is sweetened to perfection. Just mix with milk, heat, relax and enjoy. Beauty Foods unique mix of natural ingredients - including groundbreaking collagen technology - help to enhance sleep so you can wake up with a radiant glow. 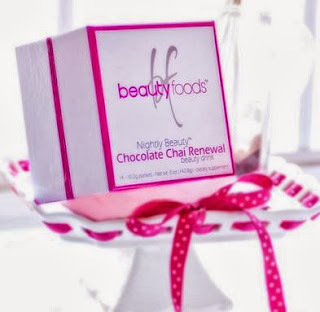 During my review, I received a box of Nightly Beauty Chocolate Bliss Beauty Drink, and samples of Chocolate Chai Renewal Beauty Blend and Vanilla Dream Beauty Blend. The Nightly Beauty Chocolate Bliss Beauty Drink comes in a pretty box that holds 14 packages. On the inside of the box, a mirror says ‘relax your beautiful’. I think this is a nice added touch to the box making it great for a gift. What makes the box so nice is that you can keep the box and reuse it by adding more beauty drinks or blends into it with their refill program. For those that have busy lives there is a nice little reminder card half way down inside the box to let you know it is time to order more. I personally think this is nice. I tired the Chocolate Bliss Beauty Drink first because I am a huge fan of chocolate. I simply grabbed my favorite mug that I typically use for hot coco and prepared my drink. I really like how easy it is to prepare the beauty drink. You simply add it into warm milk, stir, drink and enjoy. The Chocolate bliss along with the other samples I received all tasted great. The Chocolate bliss reminded me of typical hot chocolate that I love to enjoy in the cold months. The vanilla was perfect and very relaxing. Chocolate Chia was different for me as I have not tried the flavor before but really enjoyed it. I noticed that each of these drinks really relaxed me. Nothing to where I could not stay up and watch a movie if I did not want to but simply relaxed me. I did not become overly sleepy but I did sleep very well during my nights of drinking the beauty drinks. I think these drinks are a great way to end your day to help you unwind. During drinking these beauty drinks, I feel much more rejuvenated which makes me feel better and look better because I have been sleeping so well. Even with getting up every 3 or 4 hours a night. Where to purchase: You are able to make a purchase from the Beauty Foods website.